Masonic Family Cares connects Lodges and Chapters with Masonic brothers and sisters in need of a helping hand. The Masonic Home can act as a liaison between the member and the Lodge or Chapter, getting the two connected. The Masonic Home might also be able to assist if there is a financial component. For example, a Brother might need a ramp for wheelchair access to his home due to a change in his health. His Lodge would like to build the ramp, but the individual cannot afford the cost of materials. The Masonic Home may grant funds up to $10,000 per Lodge or Chapter each fiscal year for projects like this. The Lodge or Chapter must submit the application to the Masonic Home indicating the cost for materials and how their volunteer hours will be spent. 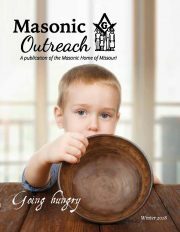 If your Lodge or Chapter is already lending that helping hand, please share your stories with the Masonic Home, so we can feature it in Masonic Outreach magazine. Mail/Fax: Download the initial form and mail or fax it to us at 573-814-4660. These guys (Cooper Lodge No. 36) mean the world to me. It means the world to me to know that they are out there.